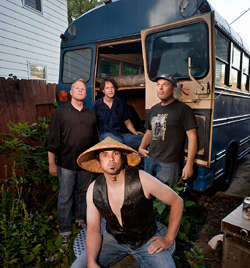 Going for broke in the Midwest during the mid-90’s alternative rock scene, HUM MACHINE was started in Madison in 1995 by four people with influences from late 80’s and 90’s indie and punk bands like Pavement and Mike Watt. Releasing their debut album, Speed Kills The Dying Beat, in 1996, HUM MACHINE spent the next decade writing songs, recording albums, playing shows for record labels, and generally chasing the rock and roll dream. In 2003, they even attempted to set a Guinness Book of World Records record for consecutive shows by performing 65 dates in a row throughout the United States. While that tour and world record was derailed by the vicious Hurricane Isabel of that fall, the band still went on to release one more album, Songs Before The Blackout, in 2005 before taking an extended hiatus. While the members of the band have continued to stay busy with the group, Shazy Hade (featuring former New Recruits blusterer, Shinky) and avant-garde jazz project, Voltress, they haven’t performed in their home state for three years. Deciding that it is high time to get the band back together, HUM MACHINE has something a little ridiculous in store for their next move. “We never broke up”, says drummer Eric Hartz, “there never was a final show or a big goodbye, so this isn’t really a reunion. We just started being busy with other projects and after awhile (they’ve performed over 700 shows live) we started getting the itch to play these songs again.” While playing together again and joking around, they remembered an idea they had. As Hartz describe, “We used to play in Stevens Point frequently and we’d always see this sign for Leeds on the drive there. So, we joked that we could make our own Live in Leeds (the legendary live album by THE WHO, often regarded as a masterpiece of its genre).” So, this Labor Day Weekend, they’re going for it. Convincing the owners of the bar, Thirsty’s, in Leeds, Wisconsin (population 813) to hold a rock show in the bar’s parking lot, HUM MACHINE will be performing and recording the show live to make their own Live in Leeds, WI. There’s a shuttle bus leaving every half hour starting at 9:30pm on September 5th from Dexter’s Bar on 301 North Street in Madison and the price is $10 for the bus (which includes beer on the drive). For those wanting to drive to Thirsty’s, the admission is free.